The peat stained waters of Swannay, the most northerly of the mainland lochs, hold some of the highest quality trout in the county, but it is probably the most enigmatic of lochs with long periods of inactivity making it very dour, but on its day it can provide spectacular sport. The earlier part of the season gives the best chance of finding Swannay fish feeding and while fish can be taken on a floating line, the use of a sinking line in various densities on the day will vastly increase your chances. Mid to late season is generally regarded as the time for dry fly tactics but the sport largely depends on the appearance of wind blown terrestrials like the Daddy, Cow Dung, and the Heather Fly. Wading can be productive but not widely practiced due to the difficulty in staying upright, the stones and rocks underfoot are extremely slippery. For best results boat fishing is recommended but be warned there are many shallow skerries on Swannay that are invisible due to the water colour so extreme caution is recommended while motoring. The Swannay fish enjoy a varied diet including -shrimp, snails, daphnia, sticklebacks, midge, caenis, sedge, and terrestrials including cowdungs, daddies, and heather flies. Wet: - Zulu, Dabblers in various hues especially claret and olive, Bibio, Sooty Olive, Stick Fly, Green Peter, Bumbles, Petersens Pennel, Palmered March Brown, Kate Mclaren. 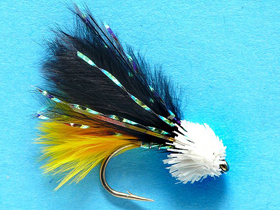 Mini Lure: - Ace of Spades, Naked Spur, Montana, Xmas Tree, Black and White cats, JC Viva, Dunkeld. Dries: -Hedgehogs and Halfhogs especially orange, olive, Bibio, Hoppers especially Bibio, fiery brown, olive, Daddies, Shipmans. Boardhouse tends to be the visiting anglers preferred loch due mainly to the fact that it is virtually skerry free and fish can be taken all over with long drifts across the middle of the loch often being the most productive. Wading can be successful at times, usually early season when fish are more likely to be feeding on the stones. With Daphnia being a major food item for the Boardhouse trout, the angler must tailor his tactics to suit the conditions. Wet: -Zulu’s in blue and black, Dabblers, Bumbles, Doobry, Peterson's Pennell, Hutch’s Pennel, Cormorants, Clan Chief, Bibio, Silver Invicta, Butchers, Bruiser. Dries: -Hedgehogs and Halfhogs especially in claret, orange, olive and Bibio, Foreman’s favourite, hoppers, emergers, Daddies and Shipmans. Hundland provides the main catchment area for water supplied to Boardhouse and is as such regarded as its sister loch with wide similarities. The water is peat stained to a degree and the loch abounds with hidden skerries, which can be difficult to spot, so caution is advised. The general shallow depth makes it very affected by fishing pressure with a large amount of boats liable to reduce the chances of some good sport. For a brown water loch, Hundland can at times fish very well in bright sunshine, something to bear in mind if sport is slow elsewhere. Wading the skerries can be productive but it is best tackled from a boat. Tactics for Hundland are much akin to Boardhouse with the floating lines being the first line of attack, prolific weed growth all but rules out sinking lines. Flies tend to be of a more traditional nature due to the fish responding to wind blown terrestrials like cowdungs and daddies. Wets: -Zulu’s, Dabblers, Bumbles, Muddlers especially Doobry, Green Peter and Hares Ear, Connemara black, Petersens Pennel, Hutch’s Pennel, Aberdeen Angus, Stick fly, Bruiser, Bibio, Kate Mclaren and Clan Chief. Mini lures: -JC Viva, Black and White cats, Ace of Spades, Wormfly and Dunkeld. 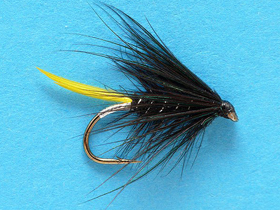 Dries: - Hedgehogs, Halfhogs, Hoppers, Dung flies, Daddies and Shipmans. Stenness is the least fished of the main Orkney lochs probably because it is most difficult to come to terms with. Its unique semi-marine environment dictates that it is very much affected by the state and height of the tides, causing wide fluctuations in water height and salinity in the loch, both of which have a marked affect on the resident trout population. Most regular Stenness anglers tend to fish it from the shore and when the loch is at its lowest. Due to the fact that there are virtually no offshore skerries and the fish tend to feed in very shallow water, wading can be very good especially in the expansive shallows of Deepdale, Voy and Brodgar. A floating or intermediate line is all that is required and make sure you fish right up to the buttercups as the fish will sometimes be feeding in their own depth of water. 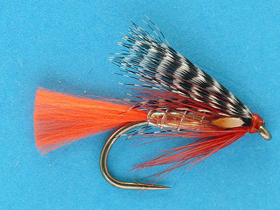 Sticklebacks, possum shrimp, snails, corophium and shrimp are top of the trout’s menu and flies to represent these can be good but Stenness trout seem to respond to more outlandish, fluorescent, gaudy patterns maybe more at home on a southern reservoir. 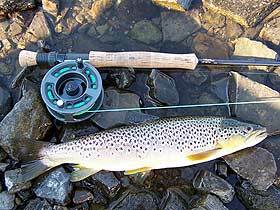 The trout can range from the 8-10 oz average to the “Holy Grail” in Orkney angling, the 4lb plus yellowbelly. At times, usually following high tides, sea trout in the 1-2lb category can add spice to the day. Lures: - Colin's Killer, Pearly Peter Ross, Orange Blobby, and Lifeguard. Harray is widely regarded as the jewel in the Orkney trout fishing crown and the most famous fishery. The loch extends to over 2500 acres and features large areas of productive skerries, shallows, bays and points, and with over 14 miles of shoreline it is probably Orkney's most popular wading lochs, especially in the earlier part of the season. As the season progresses and the water temperature increases then the fish move out into deeper, cooler water, when boat fishing comes into its own. The hard fighting Harray trout average is between 10-12ozs. but fish in the 1-2lb range are not that rare. Tactics for fishing Harray are wide and varied and can change very quickly with the trout changing their feeding habits to capitalise on the most prolific food item of that particular day and no two days are the same. The food items most important and most likely to encourage the trout to feed avidly are the chironomid (midge, buzzer), caenis, cowdung, daphnia, olive and snails. Of these, the midge can provide the most spectacular rises of fish and the best chance of the basket of a lifetime. During these periods fish can be taken in large numbers so please show due restraint. While fishing shallow water a floating line is all that’s required and this coupled with a team of flies which suitably match the hatch should ensure good sport. Deep water drifts in high summer for Daphnia feeding fish can provide some tremendous sport once the shoals of fish have been located. A sinking line of some sort can increase your chances, as can some mini-lures in various colours. Finally, a word of warning, On Harray, the very shallow water is not confined to the shorelines, some bays are strewn with skerries which will cause serious damage to both boat and outboard, so give them due respect. Wets: - Connemara Black, Ke-He, Hutch’s Pennel, Loch Ordie, Green Peter, Pearly Wickhams, Muddlers, Butchers, PTN, Crafty Devil, Cormorants, Petersens Pennel, Dabblers, Bumbles, Sooty Olive, Snatchers. Lures: - Black, White, and Olive cats, Viva, Green tagged Loch Ordie, Dunkeld, Ace of Spades, Bugs Bunny, Xmas Tree, Norsky Lad, Merkister Maid. 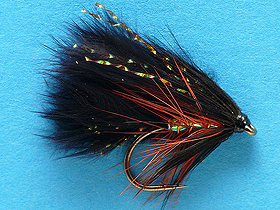 Dries: - Hedgehogs, Halfhogs, Shipmans, Suspender Buzzers, Hoppers, F-Fly, Shuttlecock, and Big Daddy. This is trophy water and the fishing is reserved for OTFA members only. The fish average over 2lb, in fact the rules of the water say that you should return anything under this weight and only keep 2 fish per session in an attempt to conserve stocks. Wets: - In large sizes, Soldier Palmer, Wickhams, Silver Muddler. This very small water which lies between Skaill and Harray can also be regarded as capable of producing specimens fish under 2lb should be returned to achieve their full potential weight. One reason for the rapid growth rates of the trout in Clumly is the vast amount of Corixa and Sticklebacks therein and the choice of fly pattern should reflect this. The loch cannot withstand heavy fishing pressure and as the season progresses the fish become increasingly difficult to locate and it is generally felt that they take refuge in the large weed beds and are therefore uncatchable. Wets; - Gold Muddler, Peach Muddler, Palmered March Brown, Coch Zulu, Silver Invicta, Gold Invicta. 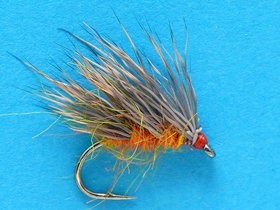 Dries: - Hoppers, Emergers, and Halfhogs. Kirbister is full of free rising trout, which tend to be of a smaller average size than most other Orkney lochs. This could be likened more to a highland hill loch and the successful flies would certainly compound this fact with big, bushy, surface disturbing patterns being the order of the day. It is regarded as a splendid loch for those new to the sport and is very popular with junior anglers due to the fact that the trout are so responsive in even the most unsuitable conditions. Wading is easy and large baskets can be taken from the first day of the season to the last. Wets: - Loch Ordie, Bumbles, Muddlers, Dabblers and Zulu’s. Dries: - Hedgehogs, Daddies, and Shipmans. The Association embarked on a policy to attempt to stock most of the trout free lochs of the North Isles of Sandy, Stronsay, and Westray starting back in 1989 and these along with subsequent stockings have proved successful with trophy fish now having been taken from most of the waters stocked. The lochs are Meikle Water in Stronsay, Burness and Saintear in Westray, and North, Roos and Bea in Sanday. Of these, North and Bea in Sanday are the most prolific with some incredible specimens caught each season, with the chance of a fish a lifetime a distinct possibility, but one thing it is not is easy fishing, with the chance of a good fish only coming now and again, you just have to put the time in to increase the chances. All the above lochs are prone to algae blooms and colour quickly during periods of high winds, this and bright sunshine can curtail the fishing, but early morning and late evening forays can greatly increase the odds on success. The regular anglers who have most success on these lochs say that you have to fish a big fly to catch a big fish so do not stint on size, palmer's tied on a long shank 8 hook can do the trick. Top of the list on the trout’s food list is the stickleback, Corixa, and shrimp. Care should be taken while wading these lochs are there are some soft muddy holes which can make it very dangerous. Wets: - Pottingers Palmer, Black IPN, Hummungus, Dunkeld, Orange Palmer, Prairie Dog, all in larger sizes. Heldale Water in South Hoy is completely different to all the other lochs in Orkney because of its great depth, up to fifty feet in parts. It also came under the OTFA stocking policy only recently and is now starting to produce quality fish but it is largely under fished due to its location and high sloping banks which make wading downright impossible on most of the loch. This large brown water loch responds best to big bushy patterns, typical for a loch which depends for most on wind blown terrestrials, and with Arctic Char being reintroduced in autumn 2002, the future for this loch could be very interesting. There are no boats for hire at this loch. Hoglinns Loch, which feeds Heldale, is thought to be devoid of fish and the Sandy loch in North Hoy does not hold many. Wets: - Zulu’s, Palmer's, Invicta family, Dunkeld, Loch Ordie.